The official announcement of Samsung's new Tab S series of tablets was one of the top news that we brought to you last week. The Samsung Galaxy Tab S 8.4 and Galaxy Tab S 10.5 are two of the best slates that the company has produced so far, packed with top-notch internals and a ton of software features. But most importantly, these stand out with their AMOLED displays. And speaking of Samsung, the rumored Galaxy F smartphone leaked again in a series of photos, stacked up against the Galaxy S5. The Galaxy F, or whatever its real moniker turns out to be, is expected to be a high-end phone with a premium build quality. In other news, a whole bunch of rumors about the iPhone 6 surfaced over the past few days, and many of them do seem trustworthy. Cases and mock-ups for both the alleged 4.7- and 5.5-inch versions of the iPhone 6 were shown off, along with a visual comparison of the device versus the iPhone 5. So here they are, the Samsung Galaxy Tab S 8.4 and the Galaxy Tab S 10.5, boasting 8.4- and 10.1-inch Super AMOLED displays. Samsung promises that the Super AMOLED displays will get closer to true colors because the AMOLED doesn't filter any light, and because it can reach 90% of the Adobe RGB color gamut, while traditional LCD only gets about 70% of the Adobe RGB gamut. Of course, AMOLED also promises better contrast and deeper blacks, and Samsung claims these tablets will offer the best visibility in bright sunlight, because they are 40% less reflective than traditional LCD. Here's one of the latest Samsung Galaxy F leaked photos. In terms of specs we should expect to see the Galaxy F packing a 5.3-inch, QHD (1440 x 2560 pixels) display, a Qualcomm Snapdragon 805 quad-core chip, 3GB of RAM, and a 16-megapixel shooter with Optical Image Stabilization. Or at least that's what rumors suggest. What you see are mock-ups of the rumored 5.5-inch and 4.7-inch iPhone 6 models. Could these really be representing what Apple's next smartphones would look like? The rumored iPhone 6 once again, this time next to the iPhone 5. And these cases are supposedly made for the iPhone 6 – one for the 4.7-inch and one for the 5.5-inch model. samsung galaxy f doesn't seems legit,it's totally fake. 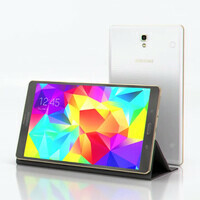 can i make voice calls using galaxy tab s 8.4? Only for the LTE version.